Thank you for joining me as we count down to the next MFT release. We are two days away from the big day! All the new Stamps, Die-namics, and Stencils will be available on Tuesday, September 1 at 10:00pm EST. Be sure to check out the MFT Blog to see all the new items being revealed today. Don't forget to leave a comment on the MFT Blog countdown posts, YOU could win one of the five $75.00 gift vouchers. 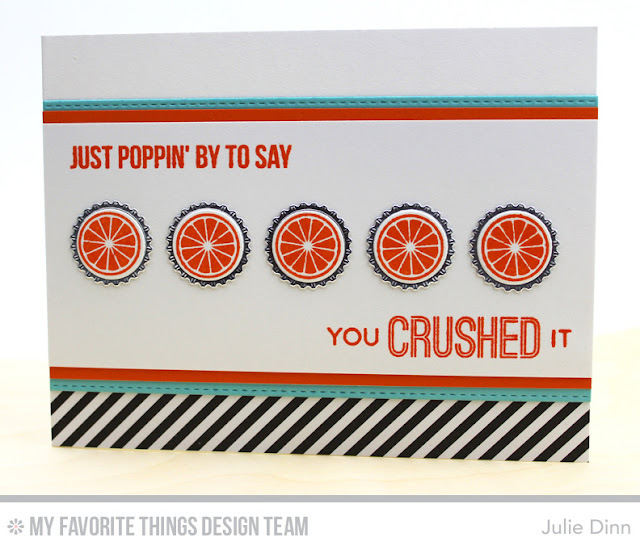 I have a fun card to share with you today, it features the new Soda Pop stamp set and Bottlecaps Die-namics by Laina Lamb. These two sets, along with the Bottlecap Letters Die-namics, Bottlecap Numbers Die-namics, and Soda Pop Bottles Die-namics are such a fun collection of products. For my card, I stamped a couple of the sentiments from the Soda Pop stamp set in Orange Zest Premium Dye Ink. The orange slices were also stamped in Orange Zest. The bottle caps were die-cut from our Silver Foil card stock. I love how realistic they look! Thanks so much for joining me again today. Be sure to check out the MFT Blog to see all the creations the rest of the team has to share with you. I so love this set!! Damn...and I wasn't going to get anything this time! Terrific compositionwith the bottlecaps surrounded by the words! Oh wow!! I love this!! Fabulous design!